Did you know? Nearly three in five home fire fatalities occur in homes without functioning smoke alarms. A smart smoke detector tests itself and alerts you when the battery is low, so you know it’s always working. The Nest Protect (left) is a full-fledged smart smoke detector. The Roost smart battery (right) can be fitted into existing smoke and CO detectors, giving them certain smart functions. Smart smoke detectors are a niche market. Few mainstream companies have put out their own models, and startups seem to have trouble getting off the ground. For example, the 2014 crowdfunded Birdi never actually shipped its smart alarms, and startup Halo Smart Labs closed its doors not long after releasing the Halo+ smart smoke detector. Limited availability and startup issues mean you want to be extra selective when buying a smoke detector. 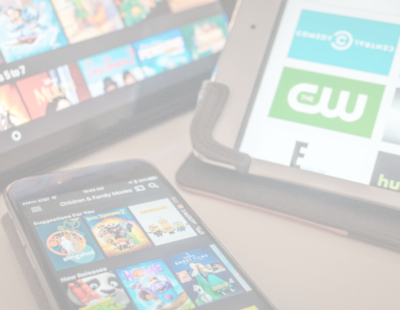 Well-established brands like Nest and First Alert are your best bet for longevity. They won’t leave you high and dry — as opposed to a company like Halo, whose closure left customers with $130 “smart” alarms that no longer connect to the internet. Of course, it’s best not to rely on brand names alone, especially when it comes to the safety of your home and family. We looked into popular smart smoke and CO detectors to make sure they’d be effective, reliable, and easy to maintain. “Listeners” like the Kiddie RemoteLync and the Leeo Smart Alert are often billed alongside smart smoke detectors, but they’re not the same thing. Smart listeners don’t actually detect smoke or CO — rather, they’re programmed to listen for your existing smoke and CO alarms and send you a mobile alert if one sounds. We didn’t consider any listeners for this review, instead focusing on smart smoke detectors. A smart detector combines smoke and carbon monoxide sensors into a single device, letting you keep tabs on both threats whether you’re at home or away. Plus, it eliminates the need to check and maintain two separate monitors on a regular basis, offering you extra peace of mind. We only considered smart detectors with both sensors. We made sure every smoke and CO detector on our list was vetted and approved by UL — a globally recognized, third-party organization that tests the safety and efficacy of home products. A UL certified alarm is guaranteed to detect and alert you to fires or carbon monoxide in the home. And, thanks to updated UL standards released in 2018, newer models like the smart alarms listed here are built to recognize a wider variety of flames and cut down on false alarms. The U.S. Fire Administration recommends checking the alarms on your smoke and CO detectors at least once a month. Not doing so can be dangerous: A study from the National Fire Protection Association found that between 2009 and 2013, one in five home fire deaths occured in a house where fire alarms were present but not working. This can happen when homeowners are unaware that a detector is defunct or has a dead battery. Did you know? Nine in 10 adults don’t check their alarms on a monthly basis like The National Fire Protection Association recommends. Smart detectors take the weight of routine maintenance off your shoulders — first, by performing automatic battery checks and sending you a mobile alert if the battery needs to be replaced. Second, by self-testing their alarms (like the Nest Protect does), so you’ll never be caught off guard by a non-working alarm system. The Nest Protect detects smoke and CO, tests itself regularly, sends intelligent alerts, and connects to your entire smart home. 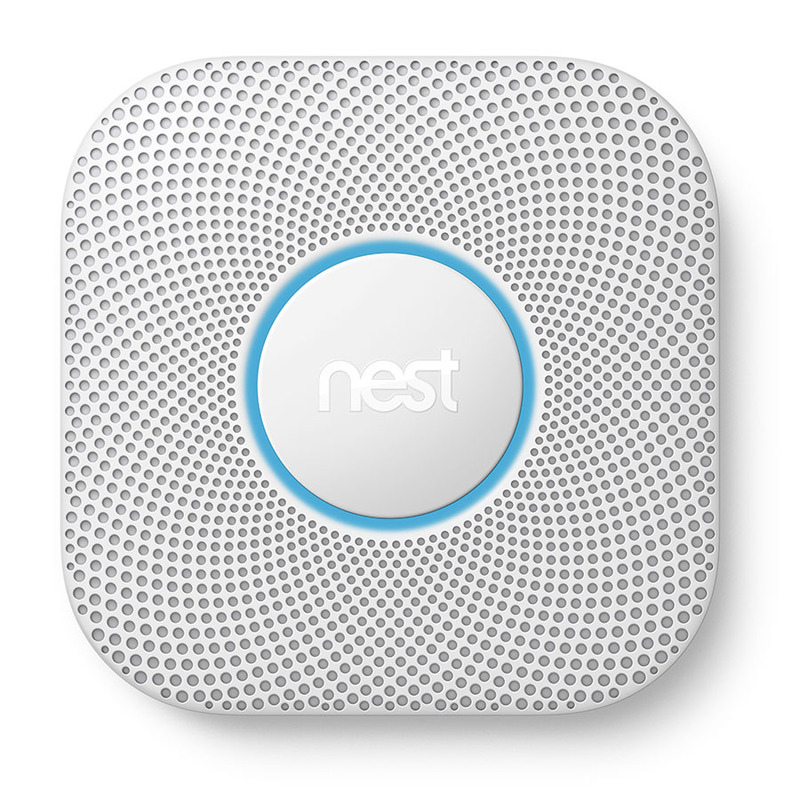 The Nest Protect's primary function is to detect smoke and CO, which it excels at: This unit responded to smoke almost twice as quickly as the First Alert OneLink in testing. However, the Nest protect doesn’t quit there. It also includes a humidity sensor, which can cut down on false alarms caused by steam; a motion sensor, which activates the Nest’s nightlight when you’re up and about after dark; and an ambient light detector, which senses when you’ve turned out the lights and lets Nest know to flash green — indicating that it has performed its self-check and everything’s in working order. The Nest Protect comes in both a hardwired and battery-powered version, so it can be installed in any home. This is far more flexible than the First Alert OneLink Safe & Sound, which requires hardwired installation. Not sure which kind you need? Simply unscrew one of your existing detectors from its mount: If it’s connected to the wall with wires, you home has a hardwired system. If not, it’s battery operated. The Nest Protect checks its battery (or backup battery, if you have the hardwired version) on a regular basis. It also performs routine siren checks every month and will send you a mobile notification if either component isn’t working properly. This ensures that your alarm’s battery or loudspeaker won’t fail when you need it. Nest even lets you set a time range for siren testing, so you can program it to do sound checks when you’re not at home. The First Alert Safe & Sound doesn’t include this feature — which we saw as a big oversight, considering that a lack of routine testing leaves many homes with non-working smart alarms. A green, glowing ring on your Nest Protect means everything is working correctly. The ring will change colors in an emergency. 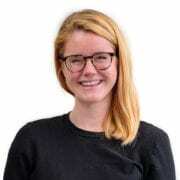 Image from Nest.com. Although the Protect is great as a standalone unit, it’s at its best when paired with other Nest devices. The family of products is designed to work together in intelligent ways: for instance, if Nest Protect detects an emergency, your Nest Thermostat can be programmed to shut off all heat and forced air systems to prevent the spread of smoke or CO. 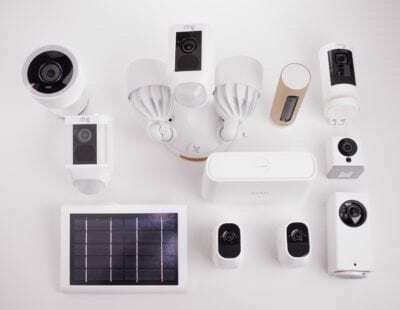 These abilities are expanded by a long list of “works with Nest” products, which link directly to Nest devices without the use of an extra smart hub or app — including Google Home, Yale smart locks, Philips Hue smart lights, Vivint smart security, and more. Nest Protect also works with the IFTTT (“If This, Then That”) app, which lets it connect to smart products outside the Nest or “works with Nest” family more efficiently. For example: If you use smart light bulbs and locks, you could set up a command through IFTTT that turns on all the lights and unlocks doors when the Nest Protect detects a fire — letting you evacuate the home more quickly if necessary. The one place where Nest Protect is lacking compared to its main competition — the First Alert OneLink Safe & Sound — is voice assistance. The Safe & Sound comes with a built-in, Alexa-enabled speaker, which can respond to voice commands, stream music, and perform just about all of Alexa’s skills. That said, the Safe & Sound costs a full $100 more than the Nest Protect, and it doesn’t improve on any of a smart detector’s key features (like smoke and CO detection, mobile alerts, or automatic testing). And since most homes require multiple detectors, you’ll end up paying that extra $100 — the same price as as Amazon Echo — a few times over. To maximize smart capabilities and minimize cost, we’d recommend buying a Nest Protect and Amazon Echo separately, rather than opting for the Safe & Sound. What is a smart battery? The Roost 9-volt Smart Battery isn’t technically a smart detector. It’s a wifi enabled battery that turns your existing smart detectors into pseudo-smart devices. 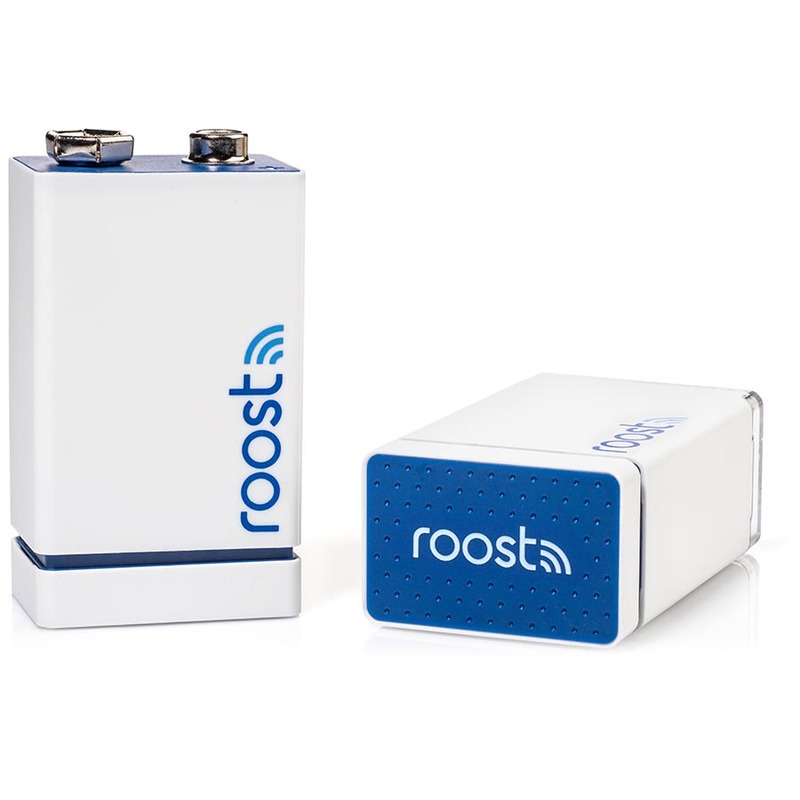 Once it’s been installed in your smoke or CO detector, Roost’s battery links to your smartphone through the Roost app. This link enables the same core features as a smart smoke detector — including mobile alerts, low-battery notifications, and remote silencing. The Roost 9-volt Smart Battery's main selling point over a “true” smart detector is its price point. At just $35 per battery, Roost is a fraction of the cost of a Nest Protect or First Alert OneLink. You’ll be able to outfit a four- or five-detector home for around $150 — as opposed to the $650-or-so that it would cost to install five Nest Protects. Roost also sells a replaceable charge pack for $15, so you won’t have to buy a brand new $35 unit when your battery’s 3-5 year lifespan is up. The Roost battery works with your existing smoke or CO detectors, making it totally painless to install. Just pop the old battery out and the Roost battery in, then link up to the Roost mobile app and you’re good to go. Note that the Roost smart battery can be used in both battery-operated alarms and hardwired alarms that have a battery backup (which most do) — meaning it can be used in almost any home. While most states require hardwired alarms in newly-constructed buildings, this regulation generally isn’t enforced for older homes, where the cost to transition from battery-powered to hardwired alarms would be steep. Installation costs vary by state and company, but they average around $65 for the first unit, on top of the cost of the detector itself, plus another $20 for each additional unit. If you have an older, non-hardwired home, installing Roost smart batteries is a good way to get the added protection of interconnected alarms without the added expense of new hardwiring. The Roost battery’s smart capabilities are limited to mobile alerts, low-battery notifications, and remote silencing — which only works if you have battery-operated smoke or carbon monoxide alarms, not hardwired alarms with a battery backup. Roost doesn’t connect to other smart home devices like the Nest does, and its only IFTTT abilities are alarm notifications and connectivity with Philips Hue lights. In short, the Roost battery will smarten up your smoke and CO alarms, but not the rest of your house. The Roost smart battery has a lifespan of 3–5 years, while the Nest Protect and First Alert OneLink both use batteries with a 10-year lifespan. That means you’ll have to replace it much more frequently. However, the Roost battery does send mobile alerts when it’s running low, so you’ll never have to worry about living with a dead alarm. What About the First Alert’s OneLink Safe & Sound? The biggest selling point for First Alert’s OneLink Safe & Sound is its Alexa integration. This smoke and CO detector comes with a built-in speaker and Alexa voice assistant — so it’s basically like having an Amazon Echo built into your smoke alarm. However, there were too many drawbacks for us to be comfortable recommending it. Most notably: Although the Safe & Sound performs routine battery checks, it doesn’t sound its own alarm to test the unit’s loudspeaker. Instead, it send you a monthly notification reminding you to do so yourself. Regular alerts are still a step up from non-smart detectors — but automatic maintenance is one of the biggest selling points for a smart smoke detector, so we prefer an alarm like the Nest Protect that takes the responsibility of testing off your shoulders completely. And although the Safe & Sound can be connected to other devices through Apple’s HomeKit app, it isn't compatible with IFTTT like the Nest Protect, which limits its ability to connect to your smart home. The First Alert OneLink Safe & Sound also rings in at a hefty $250 per unit (although we’ve seen it on Amazon for $200), and spending upwards of $1,000 on a stack of Safe & Sounds seemed like a worse overall value to us compared to buying multiple Nest Protects. As far as fire safety goes, newer non-smart detectors use two types of sensors (ionization and photoelectric) to detect both blazing and low-smoldering fires. That means they have the same capabilities as the Nest Protect's “split-spectrum sensor.” For carbon monoxide, standard and smart detectors work in the same way, using electrochemical sensors that trigger an alarm if they react with CO in the air. The decision between smart and standard mostly comes down to convenience. If you’re tired of scrambling to silence ultra-sensitive alarms, then a smart detector’s mobile “off” button will be huge relief. Smart detectors also check their own battery, and either self-test their alarm or remind you to do so, meaning you don’t have to keep tabs on maintenance. Plus, if you’re into smart home tech, smart detectors offer some neat opportunities for voice assistance and IFTTT. On the downside, smart detectors are much more expensive than traditional ones. For the added convenience and peace of mind, you’ll end up paying around $100–$150 more per unit. Of course, if your home still uses battery-powered detectors, installing Roost batteries at $35 apiece can be a good compromise. Smoke and CO detectors in the home can either be hardwired or battery-powered. Hardwired smoke and CO detectors are wired to your home’s electrical circuit. This means all alarms in the house are interconnected — so when one detects smoke or CO, they all sound. Most states require hardwired smoke detectors in all newly constructed buildings. Battery-powered or “standalone” smoke and CO detectors use a replaceable 9-volt battery. Unless they have wifi or smart capabilities, standalone detectors aren’t interconnected — so they’ll only sound in the room where smoke is present. These are generally found in older homes. The type of detectors you currently have at home will help determine which smart detectors you should get. The Nest Protect comes in both hardwired and battery operated versions, so it can be installed in any home. The Roost smart battery can be used in battery powered detectors, and hardwired detectors that use a battery backup (most do). First Alert’s OneLink Safe & Sound detector has to be wired in — so if your home isn’t already hardwired, you’d have to do some electrical work to use it. How do smart detectors work? 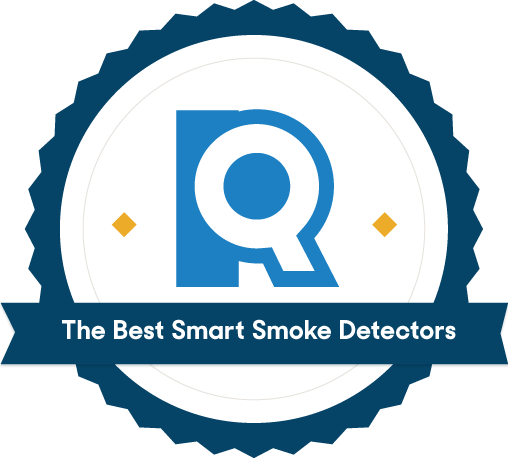 Smart smoke detectors work like traditional ones, using ionization or photoelectric sensors (or a combination of the two) to detect smoke in the air, and sounding a loud alarm if there’s fire danger. The difference? Smart smoke detectors are wifi-enabled. They’ll connect to your smartphone; allowing mobile alerts, remote silencing, and low-battery or defect notifications. Depending on the model you choose, smart smoke detectors may also offer voice assistant technology, IFTTT commands, a nightlight function, and more. Are smart detectors worth it? Smart smoke and CO detectors can be a big investment. Replacing every device in a two-story home can easily cost $600–$800. If you choose the Roost smart battery (cheaper, but with fewer features) costs drop to $150–$200. Keep in mind that most states do require interconnected smoke alarms in the home, and the rest will in the near future. So if you’re nearing the 10-year replacement period on your current alarms — and excited about smart tech — switching to smart detectors puts you ahead of the curve. If smart tech isn’t your thing, traditional hardwired alarms fulfill that requirement for a fraction of the cost. How often do you need to replace smoke and carbon monoxide detectors? The U.S. Fire Administration recommends replacing your smoke detectors once every 10 years to ensure that all sensors are working properly. Carbon monoxide detectors typically need replacing every five to seven years, according to the manufacturer’s instructions. If you’re approaching those end dates, it may be the right time to consider investing in smart detectors. How many smart detectors do I need? The number of smart detectors you need depends on the size and layout of your home. The National Fire Protection Association recommends installing a smoke alarm “inside each bedroom, outside each sleeping area, and on every level of the home, including the basement.” CO alarms have similar requirements, so you don’t have to worry about installing extra detectors anywhere you wouldn’t normally place a smoke alarm. You’re not required to replace every device with a smart version, but note that by mixing smart detectors and non-smart detectors, important functions are lost — like the ability to alert you to the specific room that smoke has been detected in. What about Birdi, Halo+, and Netatmo smart smoke detectors? A few promising startups have ventured into the smart detector market, but had trouble taking off. The Birdi smart detector, after a successful crowdfunding campaign in 2014, never made it into the hands of customers; Halo Smart Labs went out of business shortly after releasing the Halo+ smart smoke alarm; and the recently-released Netatmo smoke detector, though advertised, is not yet available in the U.S. We recommend a better-established brand like First Alert or Nest that can offer reliable, ongoing support and service for your smart detectors. First Alert keeps track of smoke and CO detector regulations by state. The U.S. Fire Administration, an extension of FEMA, develops national guidelines for prevention, preparedness, and response to fires. The National Fire Protection Association is a global nonprofit organization that develops fire safety codes, standards, and education in an effort to reduce fires and fire-related damages. The InterNACHI (International Asso. of Certified Home Inspectors) provides news and updates on home safety regulations. Outfitting the rest of the house in smart tech? Check out some of our other reviews for tried-and-true smart products that will boost your home’s IQ.